NFL teams have until March 2 to use the franchise tag on pending unrestricted free agents. Here’s a look at who should get the tag, who should sign a long-term deal, and who might end up testing the waters of free agency. Unfortunately for Bryant, the franchise tag was made for his exact situation. The Cowboys aren’t quite as strapped for cash as last offseason, but Dallas still doesn’t have the healthiest cap arrangement. Bryant’s franchise number would come in at $12.8 million, and they’ll have about $17 million in space if the cap settles at $143 million, according to Over the Cap. By shifting some bonus money around with players like Tony Romo and Tyron Smith, Dallas will likely create some more space, but franchising Bryant buys both a few months of negotiating time and another offseason to get away from some of the dead money (from guys like Miles Austin, Kyle Orton, and Doug Free) still hanging around. At this point, worries about handing Bryant a long-term deal at the top of the wide receiver market aren’t what they were a few years ago. He’s been one of the better receivers in the league for the past couple of seasons, and whatever concerns Dallas had about him away from football have mostly faded. You can’t blame Bryant for pushing back against the idea — and reports that he’d skip offseason workouts if he were franchised aren’t surprising — but the Cowboys have plenty of other holes on defense and still need to figure out a plan at right tackle. With Alex Smith’s new contract kicking in, the Chiefs have a little less than $5 million in cap space, and Houston is probably looking at a deal that’ll earn him an annual salary somewhere around the $14.3 million the Rams are giving Robert Quinn. Sacks never tell the whole story with pass-rushers, but Houston’s third-straight year finishing with double digits — he had 22 — will have him looking for a deal that comes close to setting the pace at the edge-rusher spot. The Chiefs have a few potential moves to free up room — it’d be surprising to see Dwayne Bowe still on the roster with his $14 million cap figure, and there are a few other, smaller cuts available — but franchising Houston seems like the shrewdest choice. With Houston, the same sort of debate that happened with both Jimmy Graham and Terrell Suggs comes up again. Listed as an outside linebacker, Houston’s main function in the Chiefs defense is as a pass rusher. The difference between the linebacker tag and the more lucrative defensive end tag is only $1.6 million, but if Houston does get tagged, his people will almost certainly aim for a number around $14 million — about halfway between the two. Only tight end has a smaller franchise number than safety’s $9.6 million, and the Patriots shouldn’t hesitate to bring McCourty back at that price if they can’t work out a long-term deal while also figuring out what to do with Darrelle Revis and Vince Wilfork. McCourty has been vital to the Patriots defense since making the move to safety early in his career, emerging as one of the more reliable back-end defenders in the entire league. With the deals Earl Thomas and Jairus Byrd hauled in last offseason, it feels like McCourty would be able to land a sizable number if he ended up hitting free agency, but either with the tag or with a long-term deal, I’m guessing we never find out. For me, Thomas is the most interesting case in free agency this year outside of Ndamukong Suh. It’s hard to argue with his ridiculous production: three straight seasons with more than 90 catches, 1,400 yards, and double-digit touchdowns. Only two players in league history — Jerry Rice and Marvin Harrison — have done it four times. Thomas has the speed to be a legitimate deep threat outside the numbers and is one of the best players in the league after the catch. Only Golden Tate had more YAC among receivers, and only 11 receivers averaged more yards after the catch per reception — an absurd stat, considering Thomas is 6-foot-3, 230 pounds, and nearly every receiver above him is a smaller slot type living on short throws. Where Thomas doesn’t provide as much value as top guys like Julio Jones, Calvin Johnson, and Bryant is on contested balls he has to win at the catch point. His average air yards per target this year was 9.88, 53rd in the league and just ahead of 5-foot-10 Antonio Brown. There’s no denying what Thomas has been able to do in the Denver offense with Peyton Manning, but on a team where he doesn’t run as many screens that let him work after the catch and he’s forced to compete for more contested throws, he may not be the same player. That said, Thomas is in that Peyton Manning offense, and I see the Broncos doing all they can to bring him back. Denver has said that this could mean using the tag if a long-term deal isn’t reached. Either way, it seems like Thomas is going to be a Bronco next year. Tom Coughlin said last week that if the Giants aren’t able to reach a long-term deal with Pierre-Paul before the March 2 deadline, they’d be willing to hand him the tag. A few years ago, that sentiment would have been easy to understand: JPP was among the most terrifying edge players in football — dominant as a pass-rusher and a force against the run. 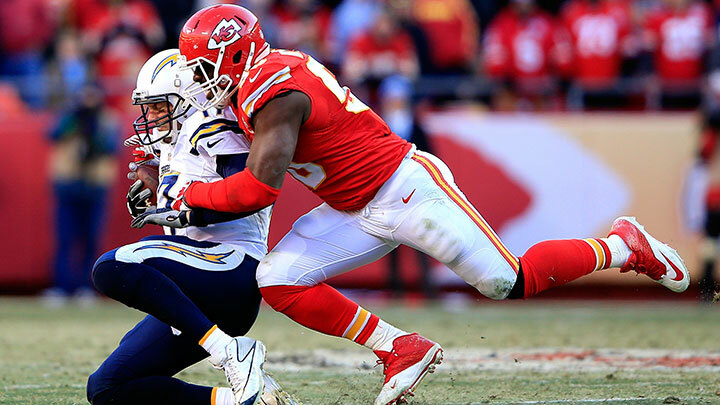 After two seasons mired by back problems, it looked like those days were gone, only for Pierre-Paul to bounce back with 12.5 sacks this past season. The 25-year-old’s agents are likely selling that total as proof that he has returned to form, but the Giants are understandably skeptical. At this point, the reasonable expectation would be that JPP falls somewhere in between the 6.5 sacks he got in 2012 and his total from this year. He’s not the same game-altering pass-rusher he was in 2011, and although he still has the size and flashes of athleticism to affect a game, he’s not as constant as he used to be. Four years ago, he was in a class of edge rusher reserved for players like Quinn and Cameron Wake. Now, there’s a chance he’s closer to someone like Michael Johnson. That’s still a player worth having, but maybe not one worth the type of extension Pierre-Paul’s after. By giving him the tag, the Giants would buy themselves another season to figure out just where he sits, but he’s by no means a lock to match the production you’d hope to get from a franchised pass-rusher. Coming off a torn ACL, Maclin decided to take a risk and play this past season on a one-year deal from Philadelphia, hoping that, healthy and in Chip Kelly’s offense, he could have the type of performance that’d earn him a multi-year deal in Philadelphia or elsewhere. 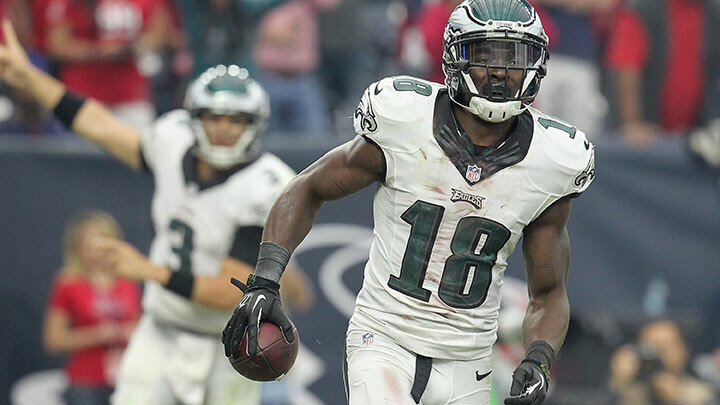 It turned out to be the right bet, as Maclin finished the year with more than 1,300 yards on 85 catches, leaving the Eagles with a decision to make. Maclin was easily going to be the most productive receiver in the Philadelphia offense next year, and even with Jordan Matthews likely to see more action in his second season, no receiver in football had a higher percentage of his snaps come from the slot than Matthews. Letting Maclin go would leave the Eagles with a massive void at their outside-receiver spots, but handing him the $13 million the tag would carry after just a single year of high-level production is its own risk. Trying to figure out a long-term deal that’s closer to Maclin’s actual value among wide receivers is probably the smartest bet. It’s hard to separate the future of both Thomases in Denver. 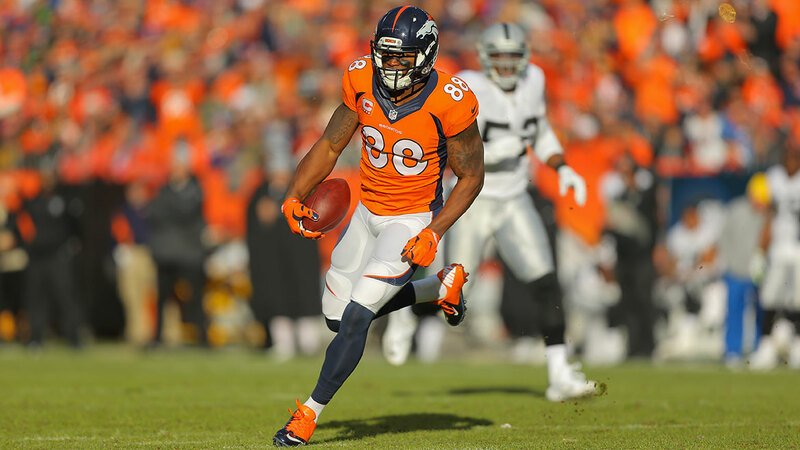 If the Broncos do manage to figure out a long-term extension with Demaryius before the deadline, they might be able to get away with franchising Julius and paying the reasonable price that the Jimmy Graham debate dictated last offseason. But if that doesn’t happen, based on what Thomas’s agent told Mike Klis of the Denver Post last week, it’s starting to feel like Denver would rather keep its no. 1 receiver and let Julius Thomas move on. 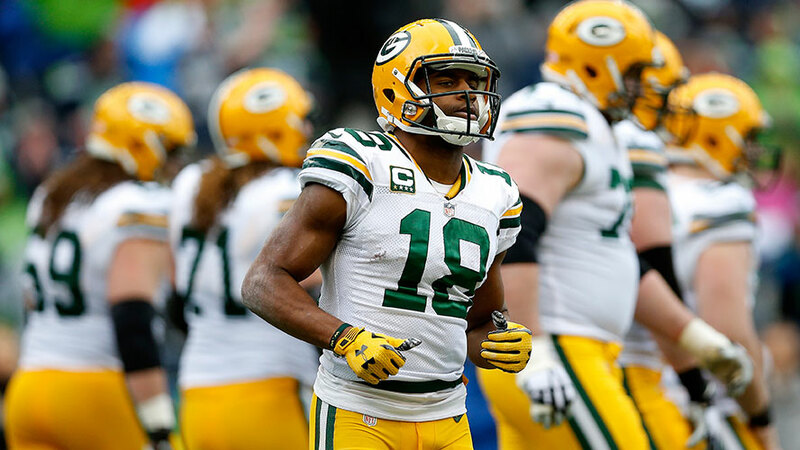 Playing the first full season of his career, Cobb was a major part of the best offense in the league. He finished the year with 91 catches, 1,287 yards, and 12 scores, but as it is with every situation, straight stats are rarely the best way to figure any of this stuff out. Jason Hirschhorn, over at the Acme Packing Company, did a great job last month of separating Cobb’s overall production from the contract we might expect him to get in Green Bay or elsewhere. Almost all of Cobb’s work comes from the slot, and historically, slot receivers just don’t see the type of contracts given to guys who make their living on the outside. I expect Cobb to be back, but it’ll be in the form of a long-term deal. We could be looking at Murray as the ultimate example of how running-back value has plummeted with the move toward pass-friendly roster construction. Murray figures to earn much more than the $3.5 million per season last year’s free-agent running backs were getting, but how much more? That’s an issue that will be explored more in the next few weeks as free agency ramps up, but for our purposes here, let’s just say that it’s tough to envision Dallas handing Murray the $10.93 million that comes with the tag for running backs. Beyond the Blue Turf: Can Derrick Marks Lead Boise State to the NCAA Tournament?